The old elephant was weakening with his ever decreasing attempts at getting up - then the night set in. The night was punctuated by the ever weakening trumpets of frustration of the old elephant. The next morning the only sign that he was alive was the puff off dust from each laboured breath. Some of the lions had gathered around in anticipation. Sensing the bull's helplessness the lions' approaches became more regular, until one took a bite at the elephants rear end. The old bull reacted as if shocked into motion - but could still not raise himself.What followed was something that was difficult to watch, yet fascinating in its savagery - as the lions began to feed on the old elephant while it was still alive. The elephant took a long time to succumb. Shimmering blue flies, sluggish and swollen, revel in the stench, celebrating in a buzzing chorus. 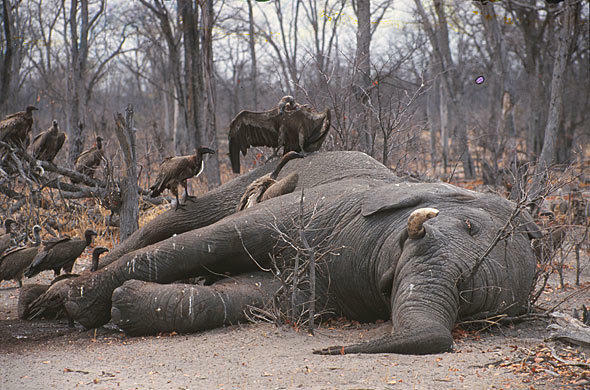 Predators and scavengers do not care for the philosophical rhetoric of humans, such as our debating of the spiritual significance of an elephant's death, for the death of an elephant provides a meal for many, and means survival for that little longer in the wilderness. The streaks of defecation on the drying skin of the carcass are an intimate indication of the true cycle of life on the African plains, and not that of the tainted ideal of life so philosophically described by us. 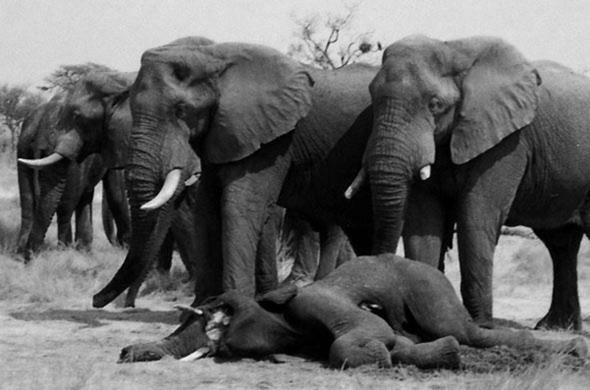 When an elephant dies the world becomes philosophical at the poignancy of the moment but when an impala dies the world's attention is piqued by the action, the impala merely the necessity for a satiation of the ideals of the watchers. An impala dying is part of the wilderness law, an attraction to be savoured, and in our warped ideals of the cycles of the African wilderness there is no contradiction in this. 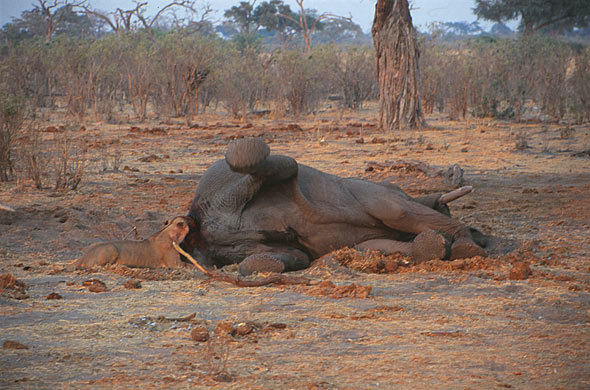 The elephant is a regal creature - and the impala is merely bait for dramatic images.When an elephant dies the captured moment is that of the passing of an icon but when an impala dies the captured moment is of the grace of the predator.